"Thank you again for all of your help! You have the kindest staff I've ever dealt with, it was a fun and memorable day!" An appointment is strongly recommended. We are very busy in the salon, and we want to ensure that one of our consultants will be available to help you. Please feel free to call the salon or send us an email to set up your appointment! Mondays through Saturdays: 9:30 a.m. to 6:30 p.m.
Sundays: 11:00 a.m. to 5:00 p.m. 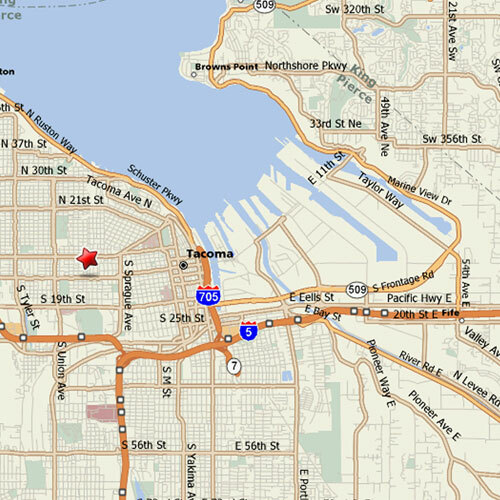 The Wedding Bell is conveniently located in the 6th Avenue Business District in Tacoma, Washington. Take Highway 16 off of I-5 towards Gig Harbor. Take the Sprague Avenue exit, and go to 6th Avenue. Turn left onto 6th Avenue, and go about 3/4 mile. It is located on your right and is a 3 story building.